Wikimedia Commons, Meckimac, CC BY-SA 3.0, 2003-05-06. Der Can­yon be­steht aus zwei Tei­len, dem Up­per and Lo­wer An­te­lo­pe Can­yon, bei­de sind aus dem Sand­stein nach und nach her­aus­ge­wasch­en wor­den. Er liegt im Re­ser­vat der Na­va­jo (Diné) in Ari­zo­na na­he des Lake Po­well. Be­son­ders zur Mit­tags­zeit er­zeugt die Son­ne herr­li­che Rot­tö­ne im Can­yon oder er­zeugt leuch­ten­de Strah­len­büsch­el (Beams von oben her­ab. Im Can­yon kön­nen durch Re­gen­fäl­le ge­fähr­li­che Sturz­flut­en ver­ur­sacht wer­den. 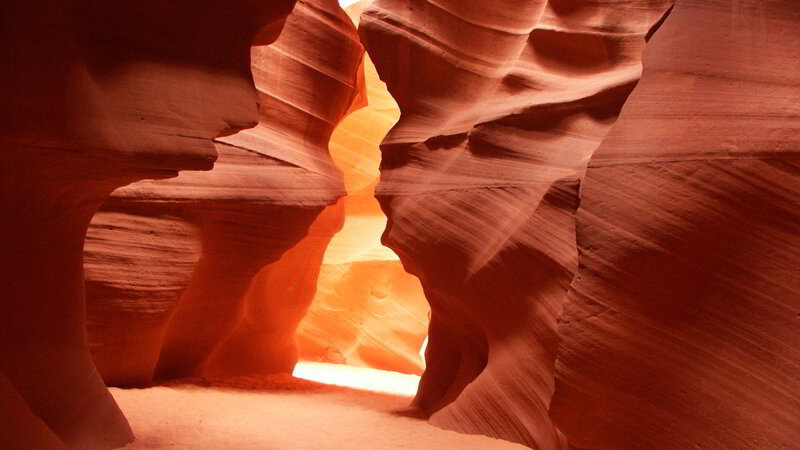 The canyon con­sists of two parts, the Up­per and the Lower An­te­lope Canyon, both have been eroded out of sand­stone. It is lo­cated in­side the Navajo (Diné) reser­va­tion in Ari­zona near the Lake Pow­ell. Dur­ing mid­day the sun causes won­der­ful red­dish tints in the sand­stone or cre­ates Beams, strong cre­pus­cu­lar rays. Rain falls can cause strong flash flood­ings in­side the canyon.